the wave front and have the same values on all planes to the left of the wave front; later we will consider more complex plane waves. We won’t concern ourselves with the problem of actually producing such a field configuration. Instead, we simply ask whether it is consistent with the laws of electromagnetism, that is, with Maxwell’s equations. We’ll consider each of these four equations in turn. Let us first verify that our wave satisfies Maxwell’s first and second equations, that is, Gauss’s laws for electric and magnetic fields. To do this, we take as our Gaussian surface a rectangular box with sides parallel to the xy, zz, and yz coordinate planes (Fig. 33-3). The box encloses no electric charge, and you should be able to show that the total electric flux and magnetic flux through the box are both zero; this is true even if part of the box is in the region where E = B = O. This would not be the case·if E or jj had an x-component, parallel to the direction of propagation. We leave the proof as a problem (see Problem 33-30). Thus in order to satisfy Maxwell’s first and second equations, the electric and magnetic fields must be perpendicular to the direction of propagation; that is, the wave must be transverse. has progressed partway through the rectangle, and E is zero along the side ef In applying Faraday’s law we take the vector area dA of rectangle efgh to be in the +z-direction, With this choice the right-hand rule requires that we integrate E . dl counter clock wise. Our assumed wave is consistent with all of Maxwell’s equations, provided that the wave front moves with the speed given above, which you should recognize as the speed of light! Note that the exact value of c is defined to be 299,792,458 m/s; for our purposes, c = 3.00 X 108 mls is sufficiently accurate. We chose a simple wave for our study in order to avoid mathematical complications, but this special case illustrates several important features of all electromagnetic waves: 1. 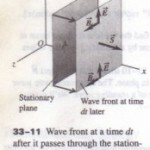 The wave is transverse; both E and B are perpendicular to the direction of propagation of the wave. 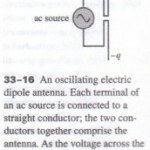 The electric and magnetic fields are also perpendicular to each other. The direction of propagation is the direction of the vector product E XB. two waves are superposed, the total E field at each point is the vector sum of the E fields of the individual waves, and similarly for the total B field. We can extend the above development to show that a wave with fields that vary in steps is also consistent with Ampere’s and Faraday’s laws, provided that the wave fronts all move with the speed c given by Eq. (33-9). In the limit that we make the individual steps infinitesimally small, we have a wave in which the E and B fields at any instant vary continuously along the x-axis. 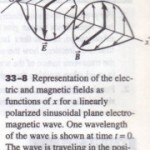 The entire field pattern moves to the right with speed c. In Section 33-4 we will consider waves in which E and B are sinusoidal functions of x and t. Because at each point the magnitudes of E and B are related by E = cB, the peri variations of the two fields in any periodic traveling wave must be in phase. Electromagnetic waves have the property of polarization. In the above discussion ice of the y-direction for E was arbitrary. We could just as well have specified the . for E; then i would have been in the -y-direction. A wave in which E is always el to a certain axis is said to be linearly polarized along that axis. More generally, wave traveling in the x-direction can be represented as a superposition of waves linearly polarized in the y- and z-directions. We will study polarization in greater detail, . special emphasis on polarization of light, in Chapter 34.